What are flamethrowers used for? Ground clearing or controlled agricultural burns. Incinerating weeds and other unwanted ground plans. Flamethrowers consist of two tanks, one holding the flammable liquid mix and one for the pressurizing agent (CO2) used to propel the flammable liquid, a wand housing and an ignition system. Carbon dioxide from the CO2 tank exerts pressure on the fuel in the other tank and forces it through the fuel hose and into the wand housing. At the same time, butane or propane is used to to fuel the pilot torch located at the tip of the wand housing to maintain the flame when the flamethrower is in standby. The flamethrower is brought into standby by igniting the pilot torch which delivers a flame to the tip of the wand. This creates a small flame that remains lit as long as it is supplied with fuel from the propane or butane canister. When the trigger is pushed pressurized fuel from the fuel tank is released through the wand, and then ejected into the atmosphere in the form of a burning combustible stream that catches fire from the small flame at the tip of the wand. Our flamethrowers are designed to operate with commonly available liquid fuels and thickened fuels. We design our products with freedom and flexibility, allowing for many mixture combinations. This versatility allows our customers to concoct unique mixtures tailored to their specific application. For max range with the X15 flamethrower, we recommend using a 90% diesel and 10% gasoline mix. If you are using our fuel thickener, 50% diesel and 50% gasoline with 1 scoop of thickener per gallon is a good place to start. Napalm available here. With the XL18 flamethrower, diesel fuel is recommended. For maximum firing range, a thickened fuel mixture is required. Start with 80% diesel and 20% gasoline with 1 scoop of thickener per gallon. What is the fuel capacity? Can I use pressurized air instead of CO2? Although theoretically compressed air could work, we recommend against it because it is not as safe, more cumbersome, and difficult to reach the same pressures. Using compressed air would require hardware modifications which would void the warranty. It’s cheap and commonly available. Extra CO2 tanks are available allowing for a quick swap to repressurise a new tank. It is extremely stable and liquefies at a low pressure which makes it ideal for getting consistent pressure from a small, light and portable 20oz tank. The biggest safety benefit of CO2 is in the chemistry. CO2 is an inert gas. Where there is carbon dioxide fire is impossible, so as you shoot your flamethrower the empty space in the fuel tank is replaced with CO2, completely eliminating the chance of internal fire. Nope, no need to worry about keeping batteries charged. Our flamethrowers are electronic free like all full size flamethrowers. Reliability: When designing a dependable flamethrower, we focused on minimizing the amount of moving parts. An electronic free system eliminates the hassle of dealing with underpowered fuel pumps and solenoids that can easily clog and fail when exposed to debris or when using thickened fuels. Waterproof: No need to worry about getting caught in the rain with your flamethrower. We designed our flamethrowers with freedom in mind, environmental factors shouldn’t stop you from throwing flames. Safety: LiPo batteries are hazardous, risky and delicate. Mixing up wires, overcharging, moisture exposure, a puncture, using the wrong charger, low voltage, sunlight or high temperatures can cause fires and spontaneous combustion. The combination of these batteries and fuels like gasoline pose a serious risk. We encourage users to be smart and to never jeopardize anyone’s safety. Beware of flamethrowers that uses LiPo battery operated fuel pumps to pressurize highly flammable liquid. Beware of flamethrowers that have vented fuel tanks and/or oxygen in those fuel tanks. Lingering flammable vapor exposed to sparks from batteries, electric fuel pump etc. creates a potentially volatile combination. How should I maintain my flamethrower? 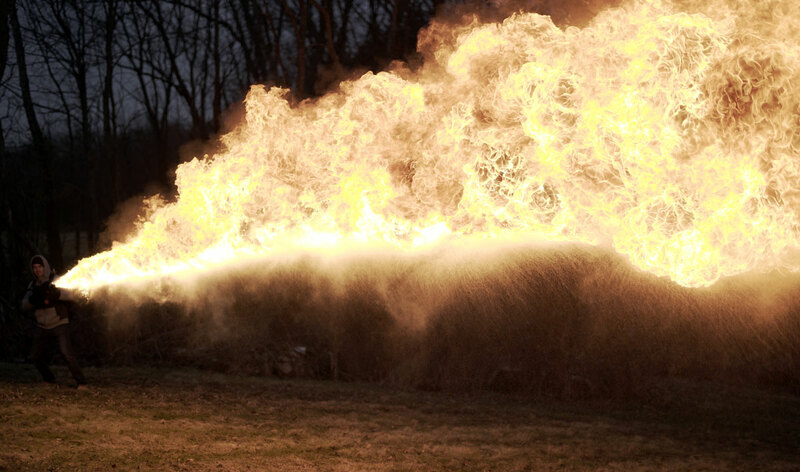 Our flamethrowers are designed for regular use and to be generally maintenance-free. How should I store my flamethrower? You should store your flamethrower depressurized and with the fuel tank empty. Please store your device out of the weather and in a secure area away from pets, children, and any other unauthorized users. Are Flamethowers Legal In My Area? Yes. In the United States, flamethrowers are federally unregulated tools and not considered a firearm by the ATF. No need for any NFA tax stamps, licensing or even an FFL dealer. However, it’s the purchaser’s responsibility to ascertain that ownership and or use does not violate any state or local laws or regulations. § 4-501(b)(2) “Destructive device” includes a bomb, grenade, mine, shell, missile, flamethrower, poison gas, Molotov cocktail, pipe bomb, and petroleum-soaked ammonium nitrate. Yes, we do ship to California. Units sent are modified with a smaller nozzle to be considered California compliant versions, meaning that the range of the device will be less than 10 feet. California users please read California Health and Safety Codes 12750, 12751, 12760, 12761 and ensure compliance before changing a tip that would produce a range over 10 feet. According to California Health and Safety Code 12750(a) “Flamethrowing device” means any non-stationary and transportable device designed or intended to emit or propel a burning stream of combustible or flammable liquid a distance of at least 10 feet. Yes, we do ship to Canada. Flamethrowers are legal in Canada, they are not considered a firearm nor a weapon and they are not a prohibited item. Our products are specifically designed for personal use for the following; ground clearing or controlled agricultural burns, ice melting/clearing, incinerating weeds and other unwanted ground plans, “back burns” or “pre burns” for forestry use and forest fire containment/prevention, or for the use in film production and movie props. Flamethrowers are legal and unregulated in most counties. Chances are, we can ship to you. We have done our best to check laws in most countries. Ultimately, you are responsible for ensuring the possession and/or use of flamethrowers is permitted in your jurisdiction. Before ordering, we encourage you to make sure you are operating within accordance of all applicable laws and regulations. We hold inventory on all of our flamethrowers and accessories so most in-stock orders are shipped within 24 hours. US orders are shipped via UPS. Once your order is shipped, a tracking number will automatically be sent to your email. Shipping speeds can be adjusted at checkout. Send us an email at [email protected] for any special payment accommodations. How do monthly payment work? We are pleased to team up with Split-it and to offer interest free installment plans for all of our USA and Canada customers. We currently offer installment plans ranging from 3 to 12 months. On the checkout page select the Splitit payment option. Your credit card will be authorized for the entire amount of your order, but only charged for the 1st month’s installment. For example, a $1,500 order using a 12 month installment plan would be charged $125 on the day the order ships, $125 each following month for the remaining 11 months. Currently only Visa® and MasterCard® are eligible (debit cards are not eligible). Send an email to [email protected] to learn about our dealer program and bulk pricing. Please visit our purchasing portal for all of your procurement needs. This portal is an electronic Request for Quote (RFQ) / Request for Proposal (RFP) system designed to allow government buyers to request information, find sources and prepare RFQs/RFPs online. Users can obtain quotes or proposals for large quantity or complex system purchases. It is a pleasure working with people that delivery such outstanding customer service!